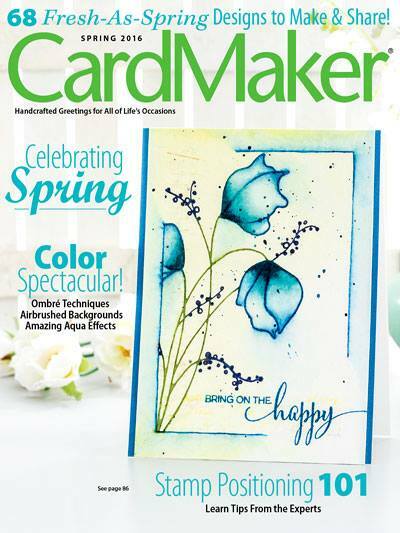 Selected as a Favorite of the week at Split Coast Stampers. 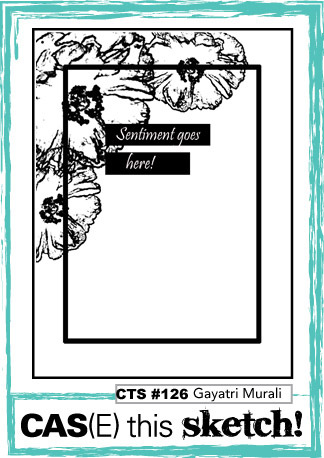 It's the Pretty Pink Posh Watercolor Blog Hop day!!!! 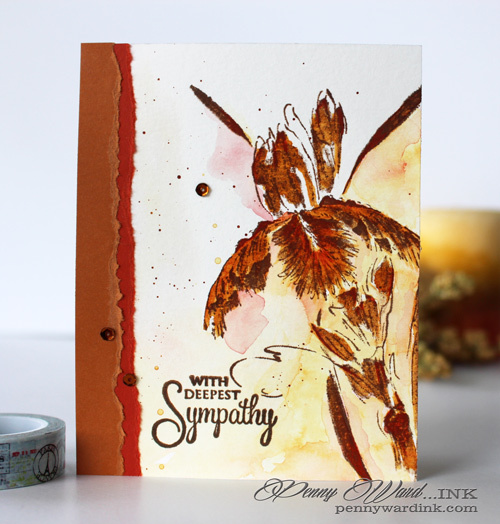 I am learning to watercolor and Penny Black just makes it so easy with their beautiful brushstrokes stamps. 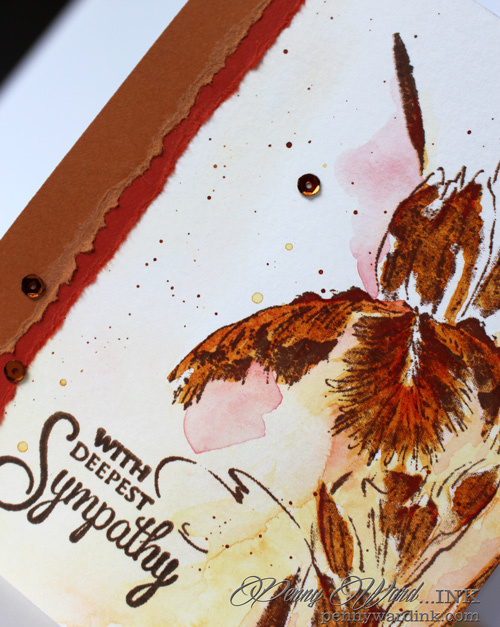 Iris was stamped with Stazon Spiced Chai, then watercolored with QOR watercolors. I really like these watercolors as they have such vibrant colors. As you can see, I must be wanting Fall to get here quickly as I have used a lot of Orange, Yellow and Red. Burnt Orange strips of card stock were torn along the edge, paint flicked over card front and sequins finish this creation. Make sure to check out Paulina's post where you will find the list of hops. You can join too, just watercolor up a creation of your own and link it up. Give it a 90 degree turn...yes, that is better! How nice is this card!!!! This card is absolutely stunning. I love the colors. Reminds me of coffee. ^_^ Thank you for sharing. Such a creative and stunning design! Lovely! Thanks for joining us at CAS(E) This Sketch! What a fabulous card! I love your take on the sketch! Gorgeous card! I love your take on the sketch! WOW - talk about stunning - loveliness galore is in this card!! That flower is just breath-takingly gorgeous!! You have done yourself SO proud with this fantastic card!! !